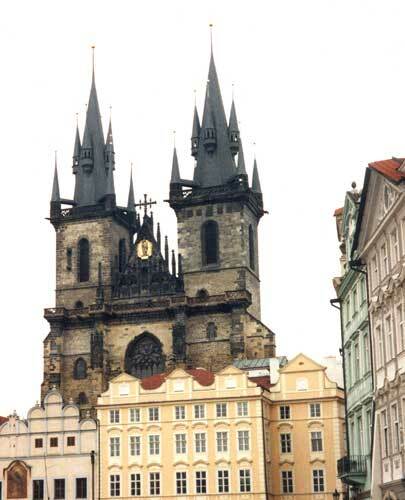 The Parish of Our Lady before Teyn in Prague’s Old Town belongs to the 1st Vicariate of Prague Archdiocese. The parish also includes St. Giles’ Church. In September 1670 a contract concerning building a new organ for the Church of Our Lady before Týn was signed with Hans Heinrich Mundt. He was born in Cologne but he lived and worked in Bohemia since his young years. He served his apprenticeship at Hieronym Artmann where he learned all skills necessary for organ-building. He opened his own workshop in the house “At the Golden Pike” in the Dlouhá Street not far from the church. 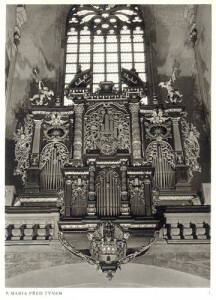 Mundt’s organ on the new western organ gallery, completed by the Italian builder Domenico Orsi, replaced the older Albrecht Rudner’s instrument from 1573 standing then in the northern side nave. The work took three years and though Mundt agreed in the contract not to undertake any other work until the organ is finished, he did not keep this commitment and worked at the same time on regals, he made two positives and clavichords. He got a decent amount of money for that work. But he came under suspicion that he used for these commissions also the material that he had got for the organ for the Church of Our Lady before Týn because the total amount that he wanted for the completed work was too high. A special committee met on April 28, 1673. The members of this body weren’t satisfied with the result of H. H. Mundt’s work (he used to claim that this organ would have no comparison in Prague), and they ordered him to rise the volume of the organ’s sound. That’s why the pedal was enriched by the register Subbass gedeckt 16 and Quint 3 was lowered to 6. And another special supreme committee that met on June 6, 1673, enforced its claim to add Bourdon Flauta 16 into the Ist manual and the tongue register into the pedal. Despite these changes the sound was not louder and so Mundt was ordered to revoice the whole organ. Today we can hardly judge if such steps were in favour of the matter or not. But the original Mundt’s idea was definitely changed. The organ kept this form practically without any change to the present time. The organ was damaged during the fire of the church in 1676 and it was not used for three years. Mundt left Prague after an unpleasant misunderstanding with the special committee but he came back later on to repair the organ. The agreement with the organ-builder Jan Nett who should have repaired the damaged organ was cancelled to enable Mundt to do the work. During the whole 18th century only common repairs were made and a really essential intervention caused only the change of tuning from the choir tone (Chorton) to the chamber tone (Kammerton). The organ-builder Josef Gartner made this adjustment in 1823 and at the same time he changed the disposition of the pedal Mixture. H. H. Mundt was very active as an organ-builder. We can name one of his first works – the organ at St. Thomas’s in Prague (1668) where he still cooperated with Matthaus Kehler, an organ-builder from the town of Svitavy. Later on he worked independently on an organ in the convent church in the town of Osek (1668 – 1670), on a choir organ for another Bernardine church in the town of Plasy (1671?) that was moved to Kralovice later on. He created a new organ for another Bernardine church in the town of Vyšší Brod in 1676. One of his well-known works is in the St. Wenceslas’s Church in Prague (1684) and also in St. Nicholas’s Church in the Old-Town Square (1685). His work is also the organ for the Sázava Monastery. 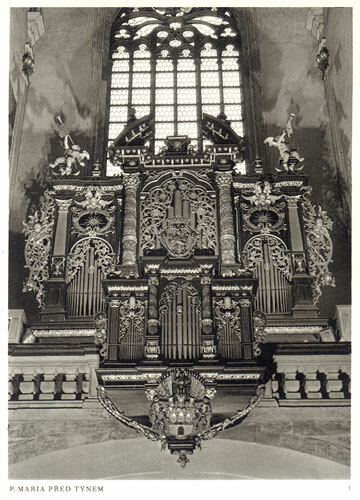 We can find this instrument in Štolmíø (1688) and there is another one in the town of Velvary at St. Catherine’s (1689) later moved to the cemetery church. From all these organs only the instruments in the towns of Kralovice, Štolmíø and Velvary were preserved and the two later mentioned ones still wait for their restoration. H. H. Mundt moved to Prague again. He spent here the end of his life and he died here on March 18, 1691. He is buried in the gallery of the crypt in the St. Giles’s Church in Prague. The Regensburg Reform of church music became a serious danger for baroque organs, and in a short time some projects were really worked out to move the Mundt’s organ away and replace it by a new organ that would meet the new needs better. One of the problematic details was the incomplete great octave characteristic particularly for the so called South-German organs. Fortunately it didn’t happen because of financial reasons but another disaster could have been also requisition of the tinny-pipe prospect for war purposes. But luckily the instrument was saved even from this threat. In the main organ case there are the voices of the Ist manual and pedal. The positive in the choir parapet is the diminished main organ case with the organ stops of IInd manual. The manuals have a short great octave and the diapason of 45 tones (C – c) and the pedal has 18 tones (C – a). 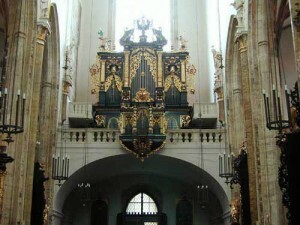 The organ was restored by the Klais Company from Bonn in 1998 – 2000, and except the restoration of the main organ case the whole restoration was financed by the German party. There were well-known artists at the Church of Our Lady before Týn as organists and choirregents. One of them was Tomáš Baltazar Janovka – the author of the first music dictionary of the new era “Clavis ad thesaurum magnae artis musicae”. Josef Ferdinand Norbert Seger was an important contrapuntist and organist. He played in this church for 41 years. We can find among his pupils for example Karel Kopøiva, Jan Ev. Koželuh, Josef Mysliveèek, Jan Jakub Ryba, Jan Hugo Voøíšek and many others. Form the present time we must mention doctor Vladimír Nìmec – the author of a valuable publication on Prague organs.